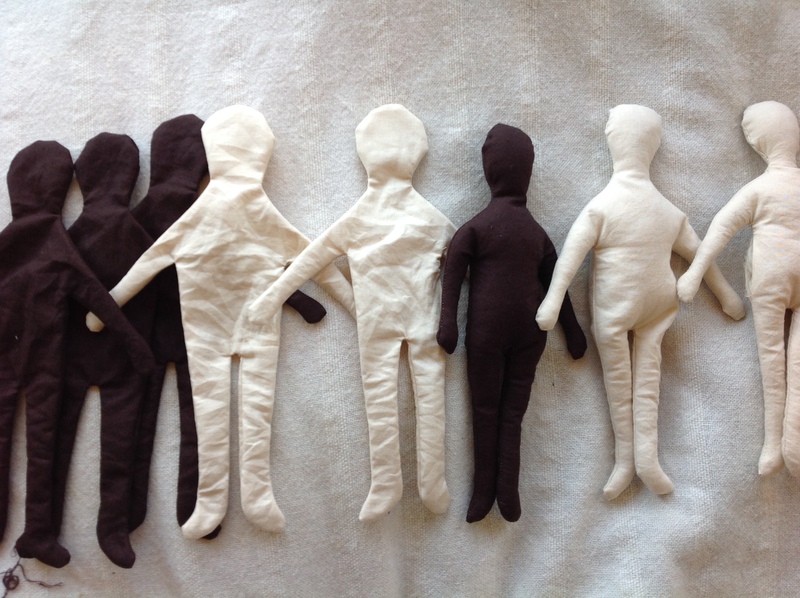 The dolls grow out of a pattern cut from my coffee training folder. They multiply. And fill up, one by one, with wool. Then they grow hair. French knots, tied with embroidery floss. And then they get dressed. 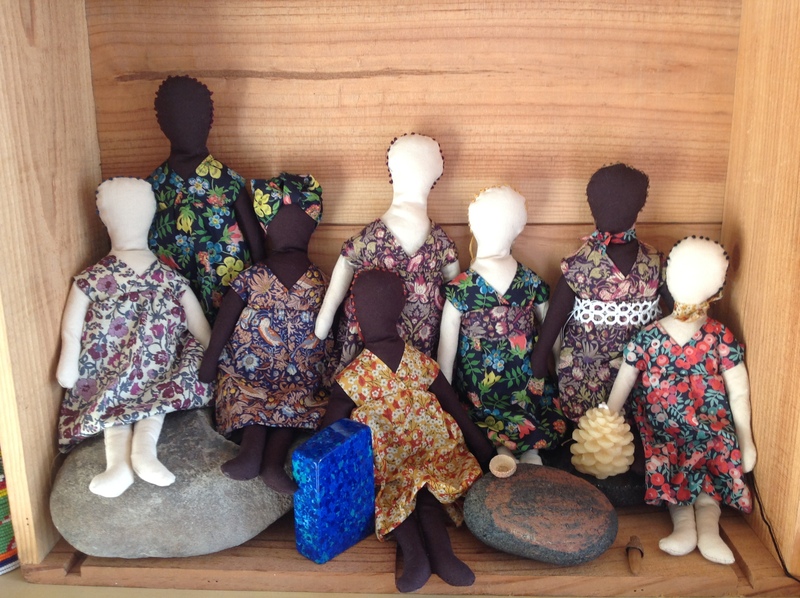 These dolls like fancy dresses. 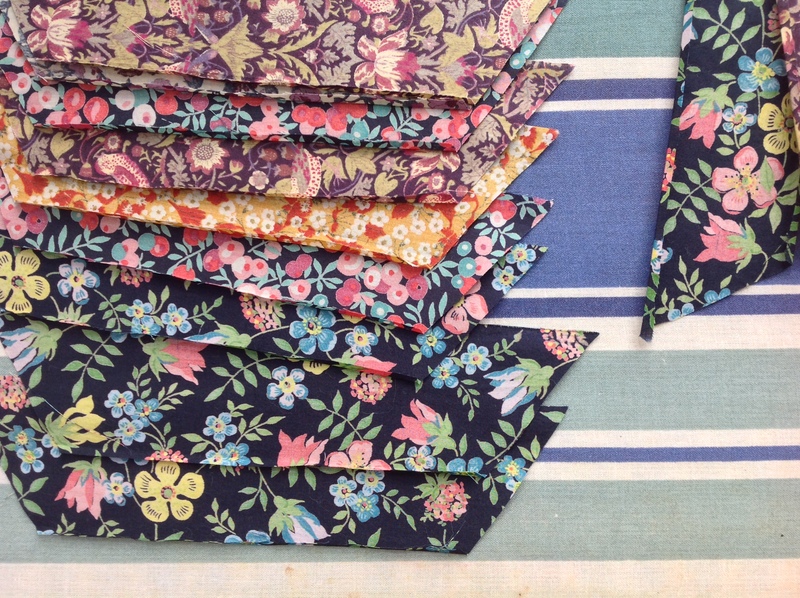 Cut from scraps of Liberty cotton. 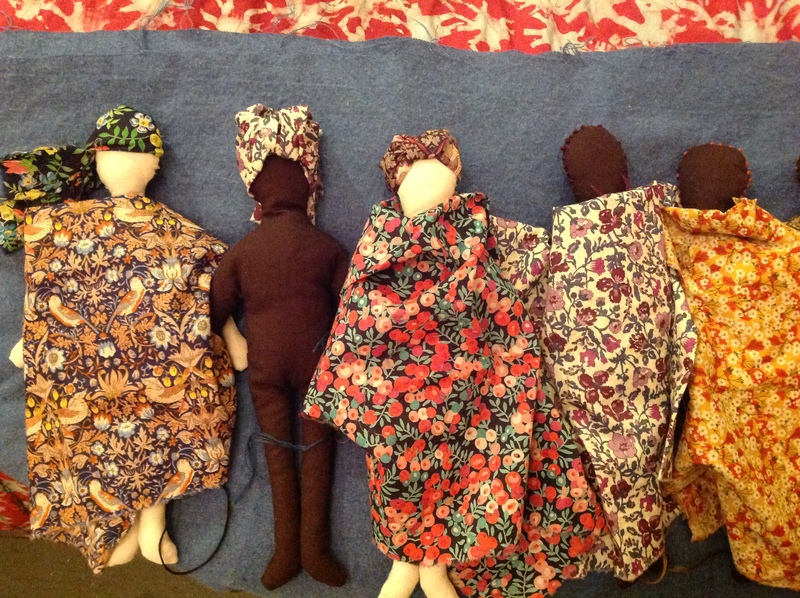 They all try on different fabric scraps. Which are then cut into multiples of geometric shapes for bodices. 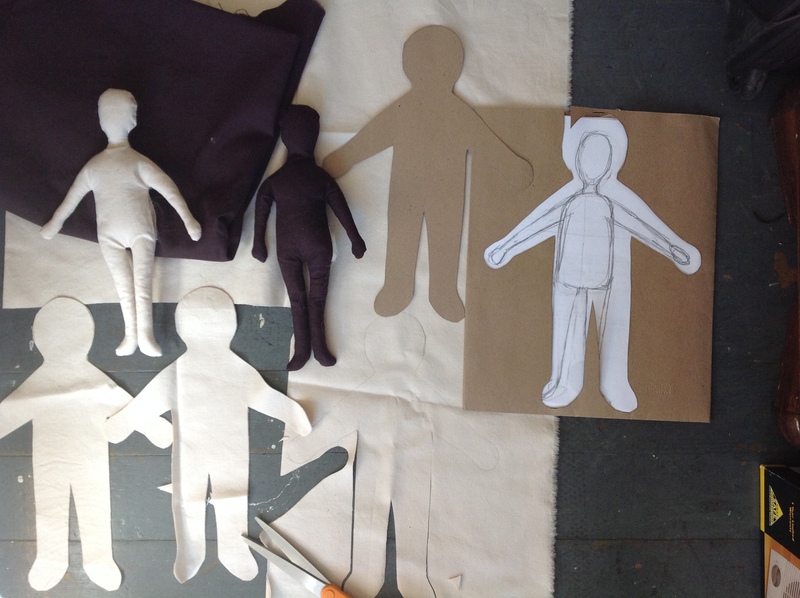 The shapes are stitched together. Pretty soon they are all dressed. I was at the train station few months ago, and saw the most amazingly dressed man. He was wearing a beautiful Liberty of London button down shirt, and the perfect pair of jeans. I was taken by the outfit as it traveled onto the train, through airport security, and all the way to Dallas…when the man walked off the airplane from few rows in front of me. 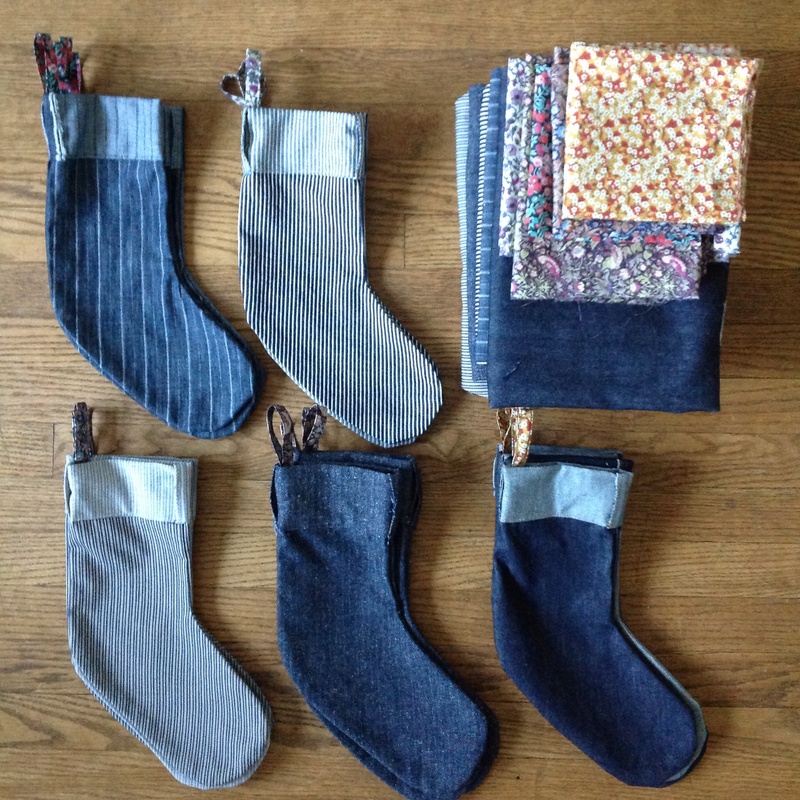 When my sister suggested sewing denim Christmas stockings, the inspiration stayed with me. These stockings aren’t too big. Perfect for special treats, a walnut or two, and a tangerine. Maybe some marzipan, or little bar of chocolate. There are 5 different designs, some right side out, some inside out. They are all unique, and mix and match well! 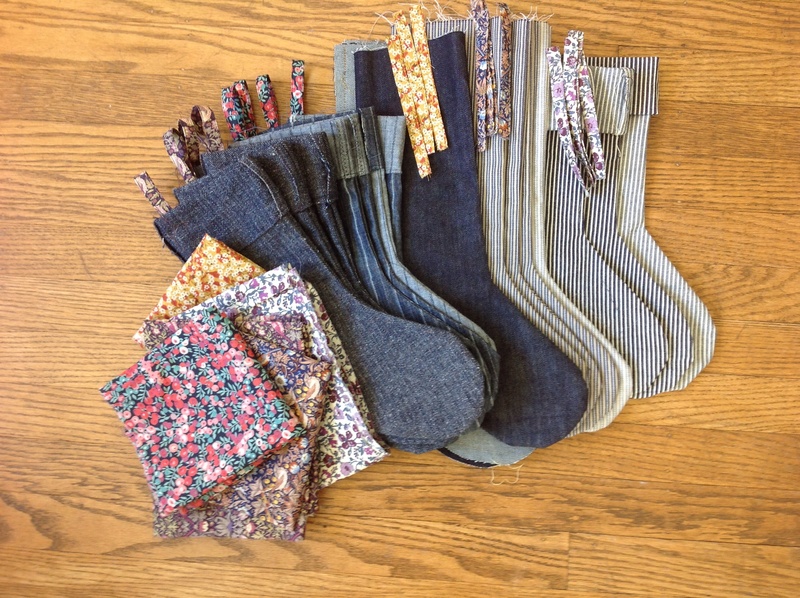 Each of the different denim fabrics has a different Liberty print loop to hang on the mantle. 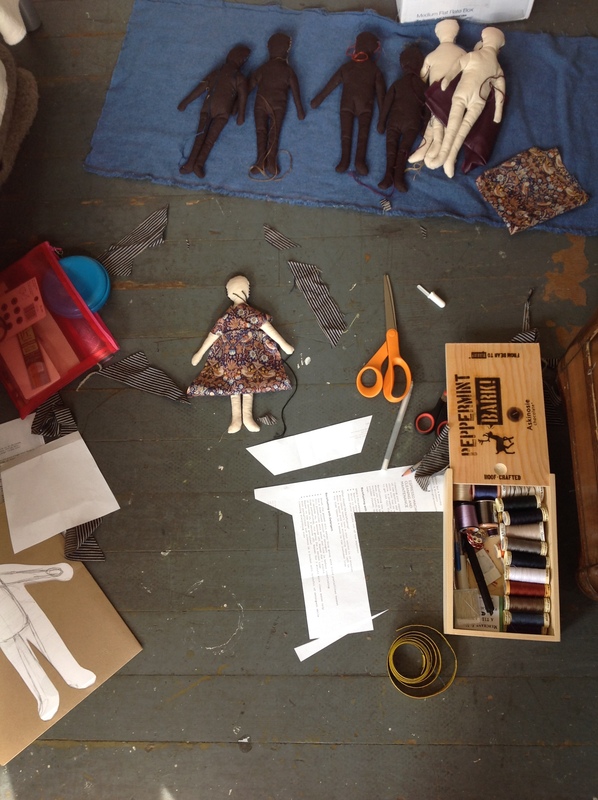 I felt a little bit like an elf all weekend, with piles of fabric and stockings migrating around the room. 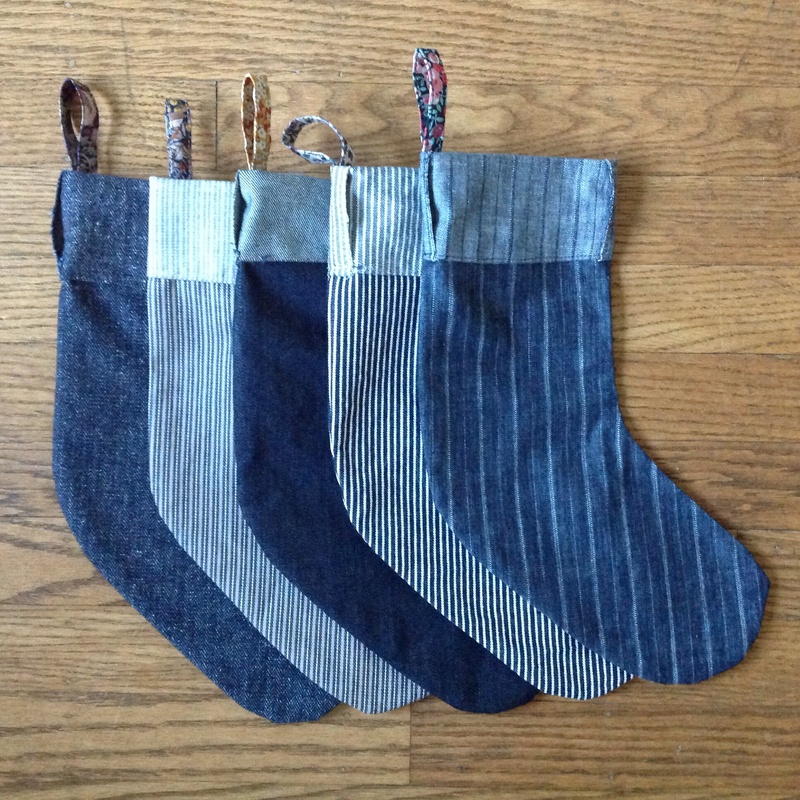 Now the stockings are finished, and ready to go to their new homes. 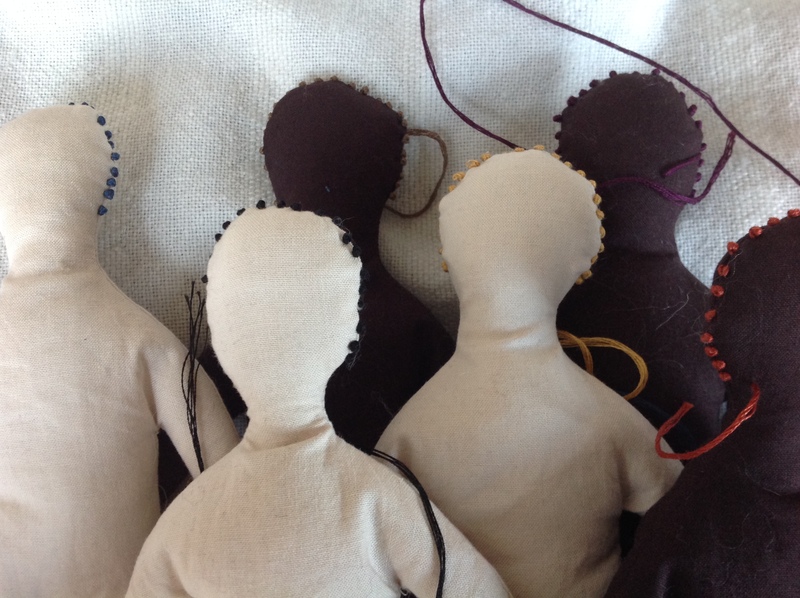 They are available in San Francisco at Beacon Coffee and Pantry, and online at Etsy.com, shop name: TorreyWitherspoon. 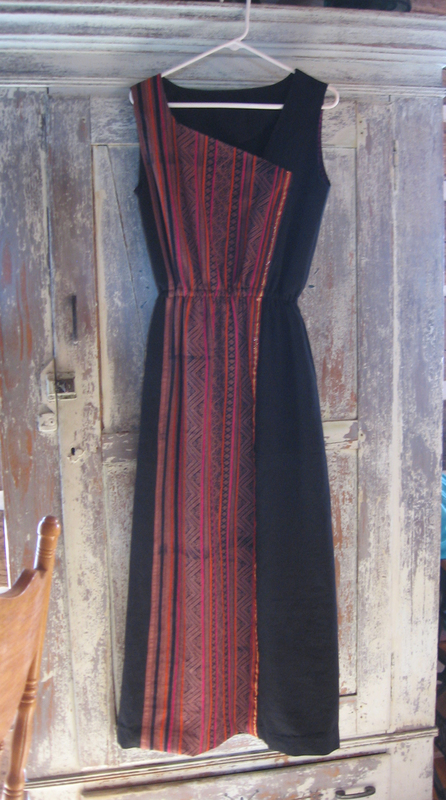 Another hand-woven cotton and vintage fabric dress. 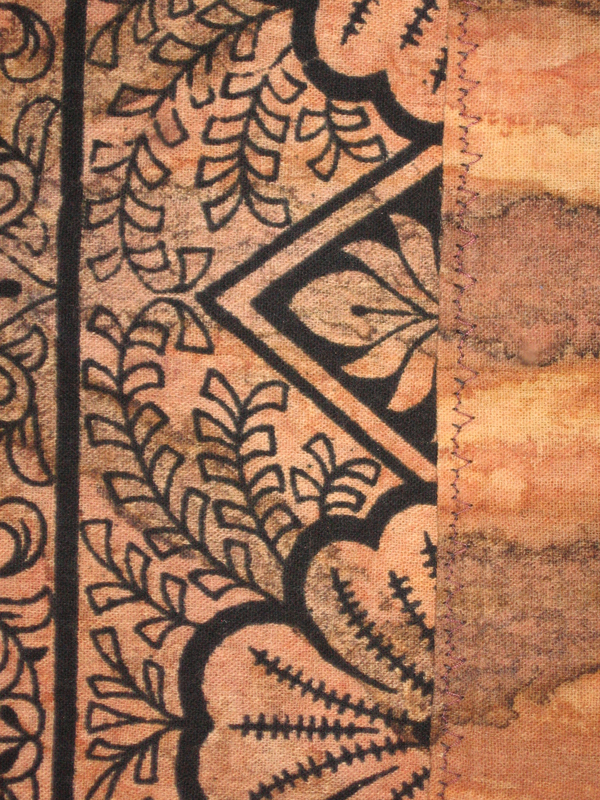 The black fabric is hand-woven cotton, and the brown from a roll of fabric that I found nestled among countless delightful rolls in a quiet little alley. 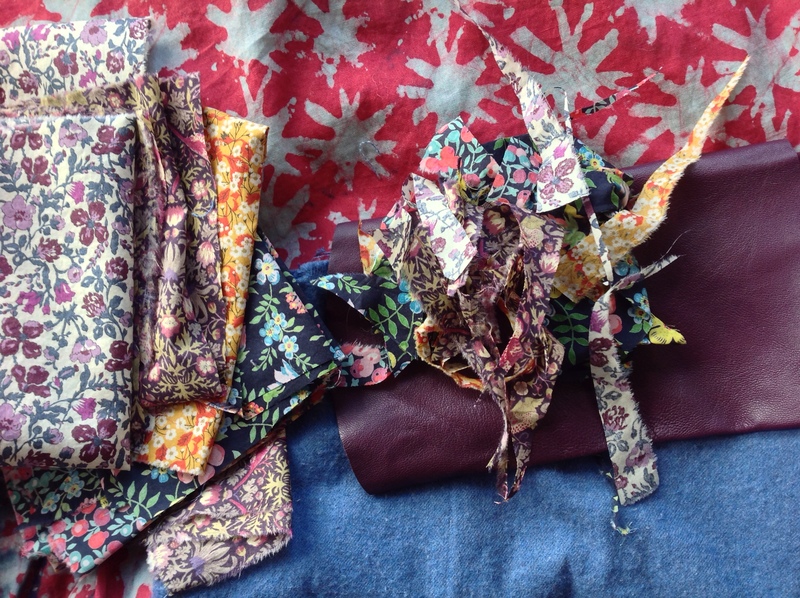 There is nothing like the feeling of pulling out rolls of fabric, each more wonderful than the next, and collecting them in your arms until you can’t hold anymore! Initially I had planned on making a horizontal neck line for this dress. I tried the top part of the dress on and decided that it looked better at an angle. The line worked better with the strong vertical line of the brown section. 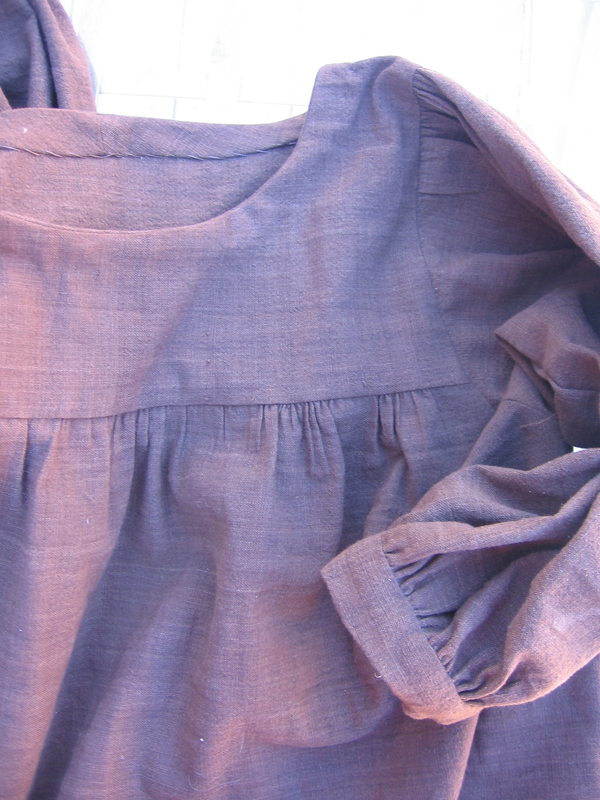 The brown fabric on the bodice is sewn at an angle onto the black bodice. 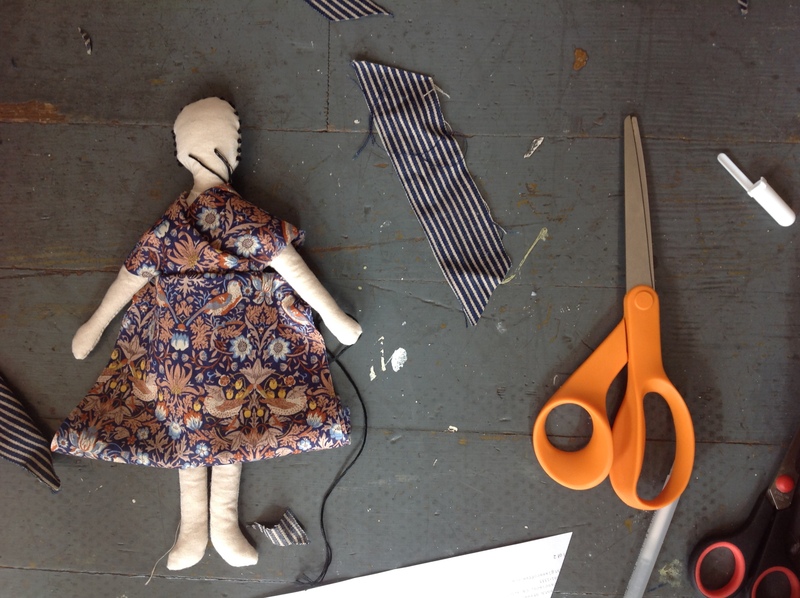 The angles of the shoulder, neck, and front pull the eye into the waist and then opens up again with the skirt. 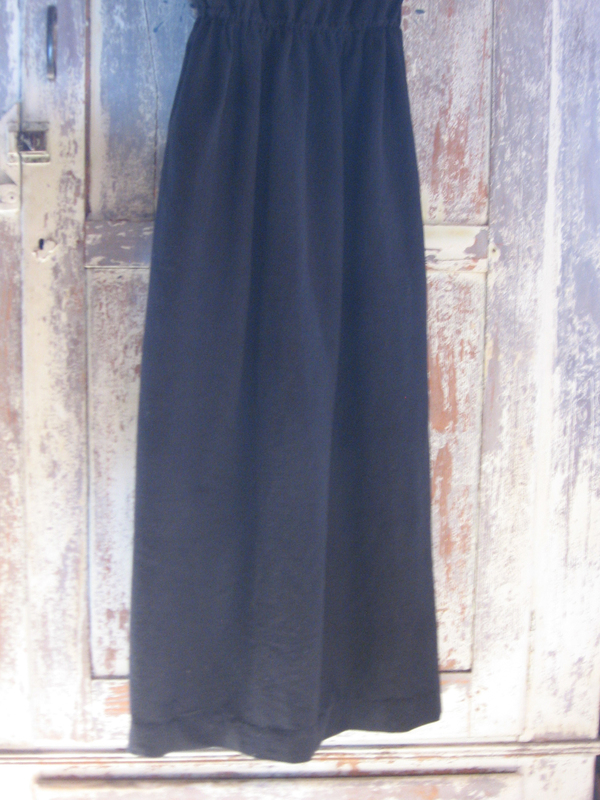 The back of the dress is all black. 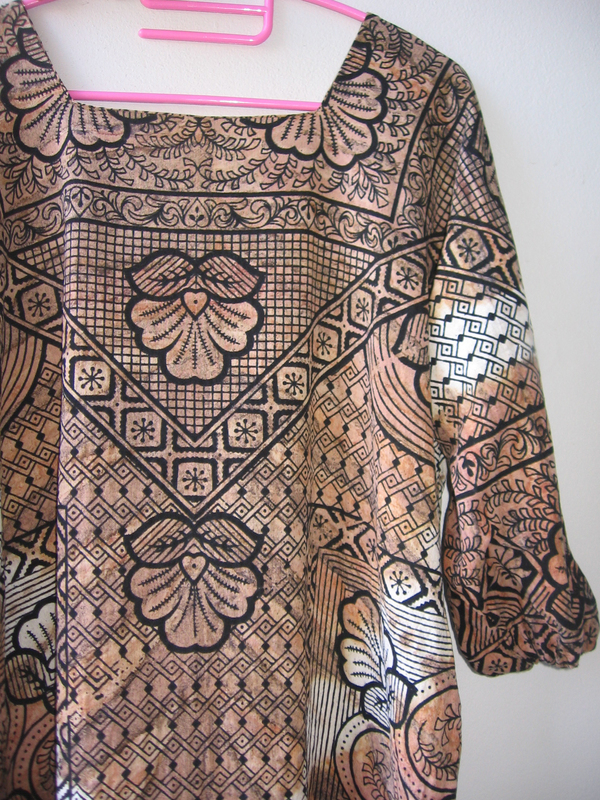 Because there is so much going on with the pattern and embroidery on the front I left the back plain. It is important for me to have some major elements of simplicity in design. Things can get too busy. I haven’t managed to buy bias tape to line armholes and the like, so I came up with some fabric left over from another project. So the armholes are lined with purple and black spots.. 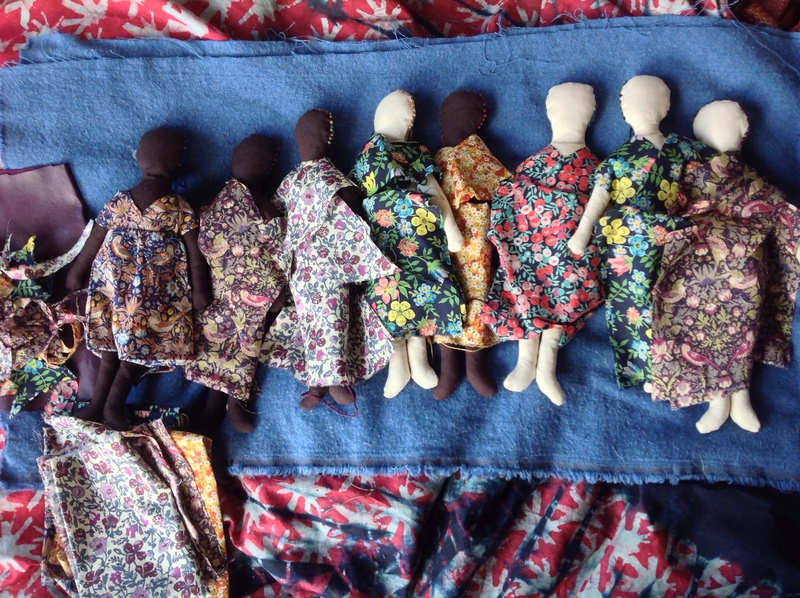 These dresses are all the same pattern, using different fabrics. 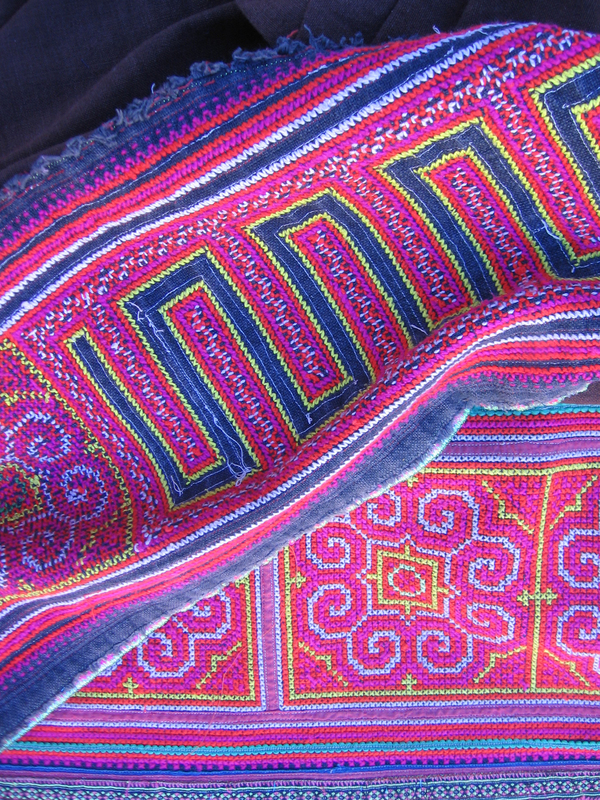 Made with a combination of hand-woven cottons and vintage embroidered skirts, both from the hill tribes of northern Thailand. 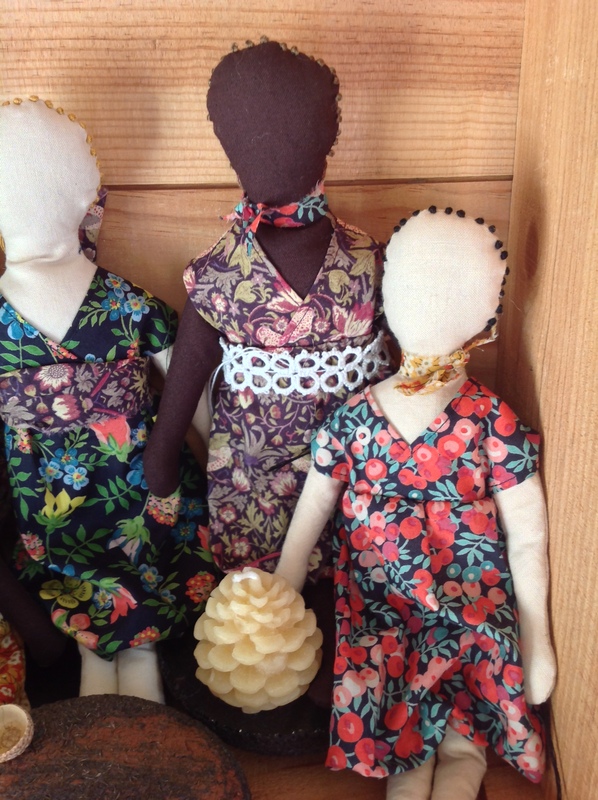 There are three dresses. 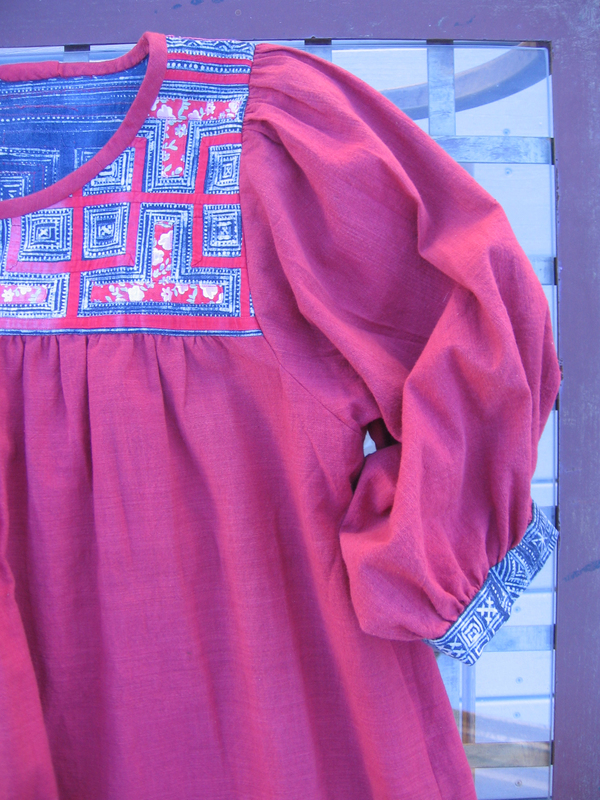 The first is red with blue and red embroidered bodice and trim. 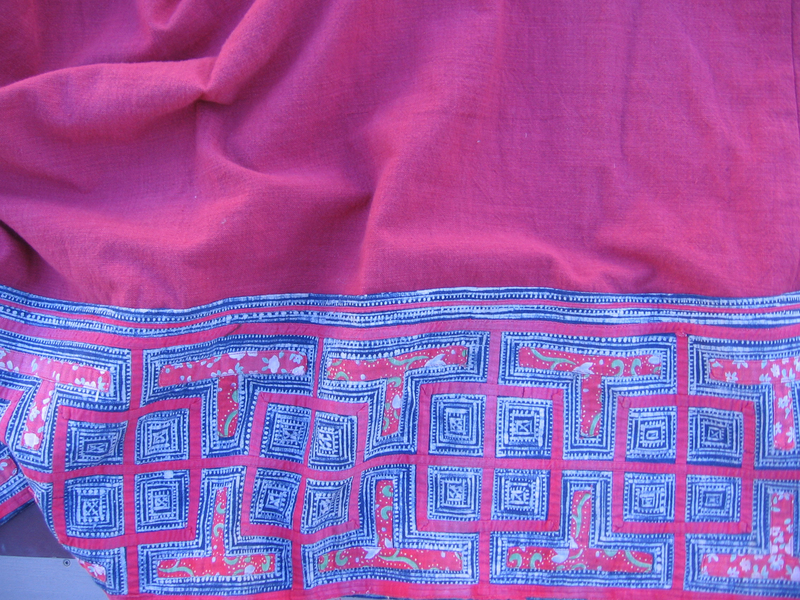 The red fabric is hand woven cotton. It is a thinner weave, and very soft. 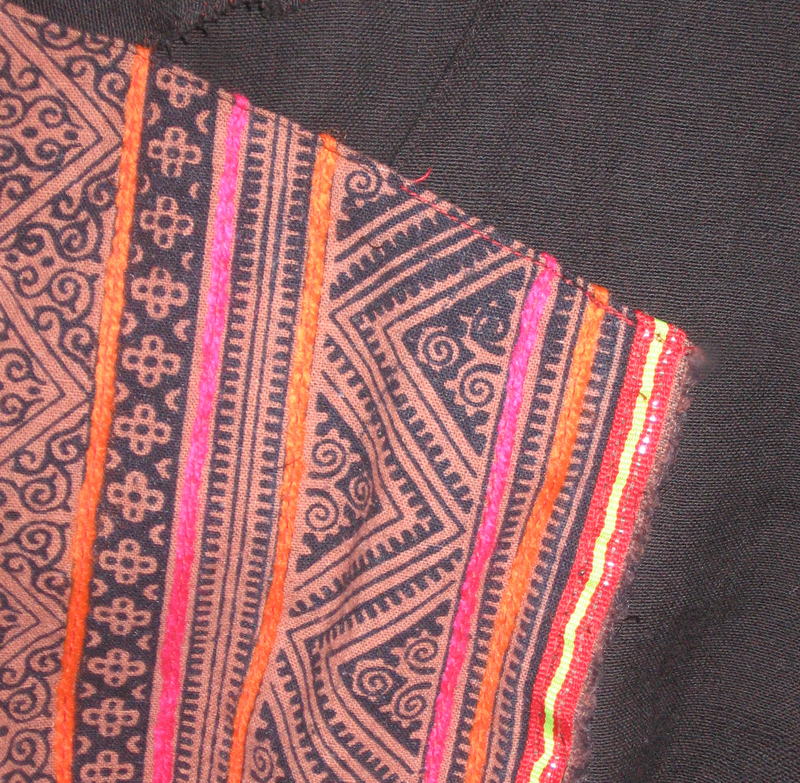 The embroidered fabric was originally a skirt. 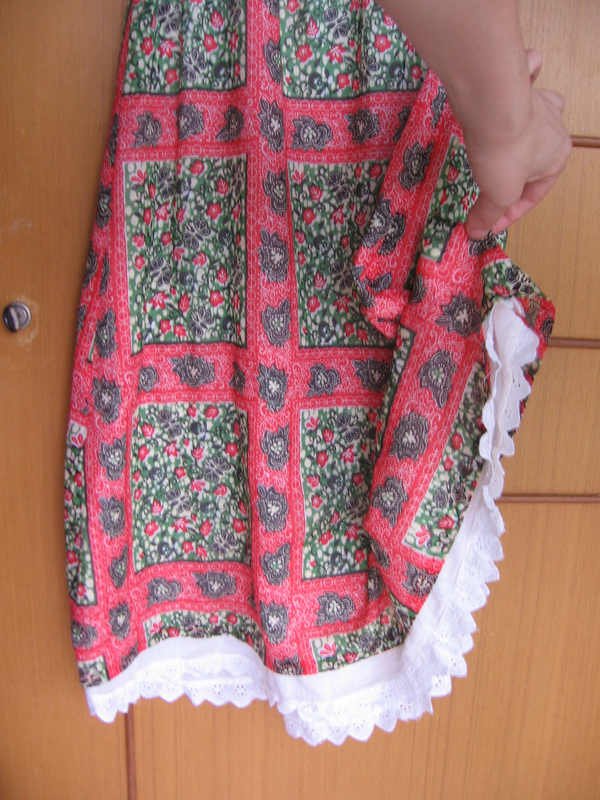 I took apart the embroidered and appliqued skirt, and only used one of the sections, pictured below. I have the bottom section left for something else. 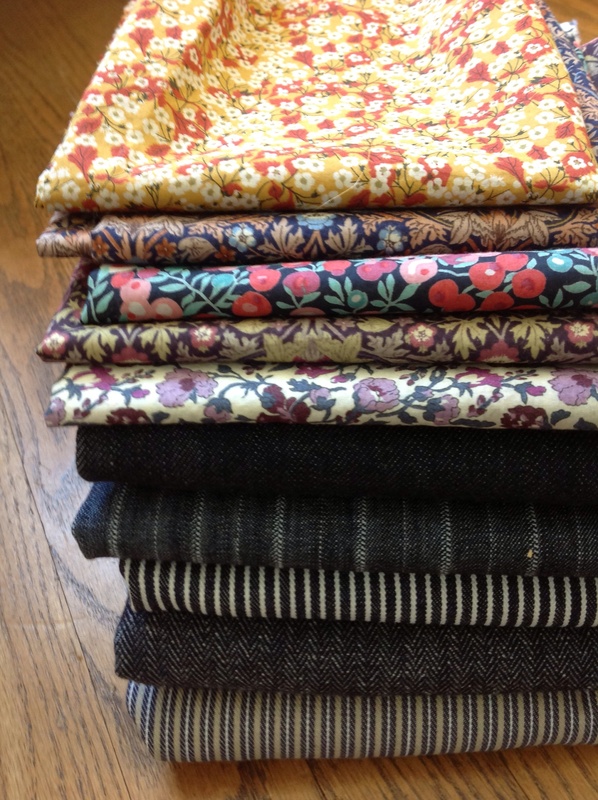 It includes a corduroy trim and more fabric patchwork. The brown dresses are a little bit simpler. The bodice is all the same color. 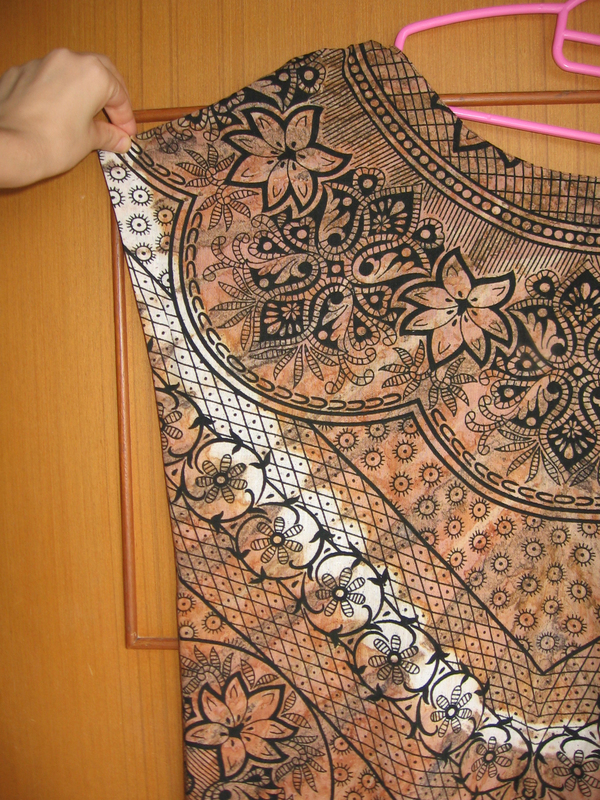 On the first brown dress I added a hem of another skirt. 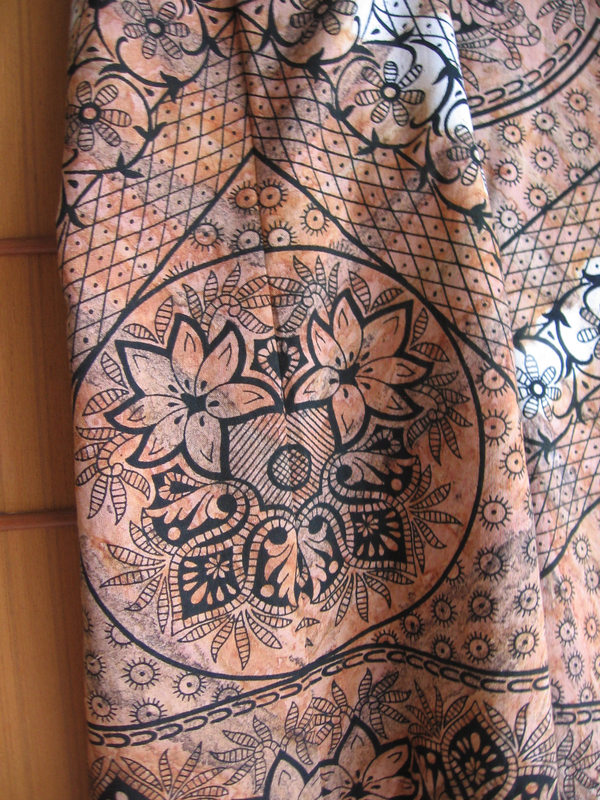 This particular skirt was all hand embroidered. I fell in love with the back of the skirt and used it instead of the front. 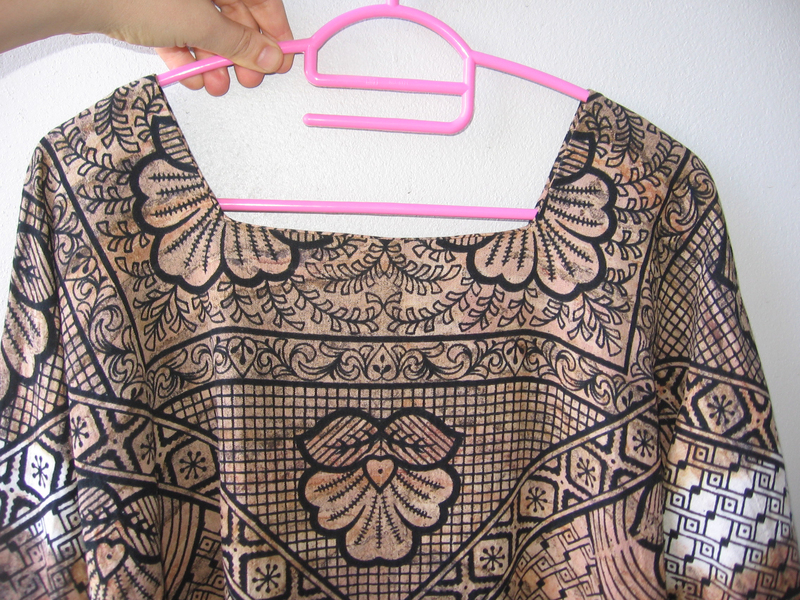 The above picture is of the “right side” of the dress, using the “wrong side “of the skirt border material. 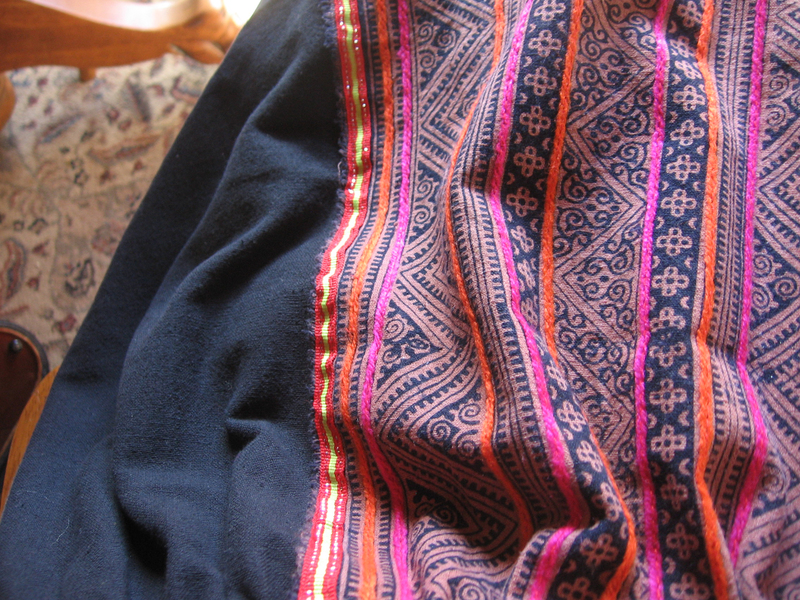 Below is an image of both the wrong side, top, and the right side of the fabric, bottom. 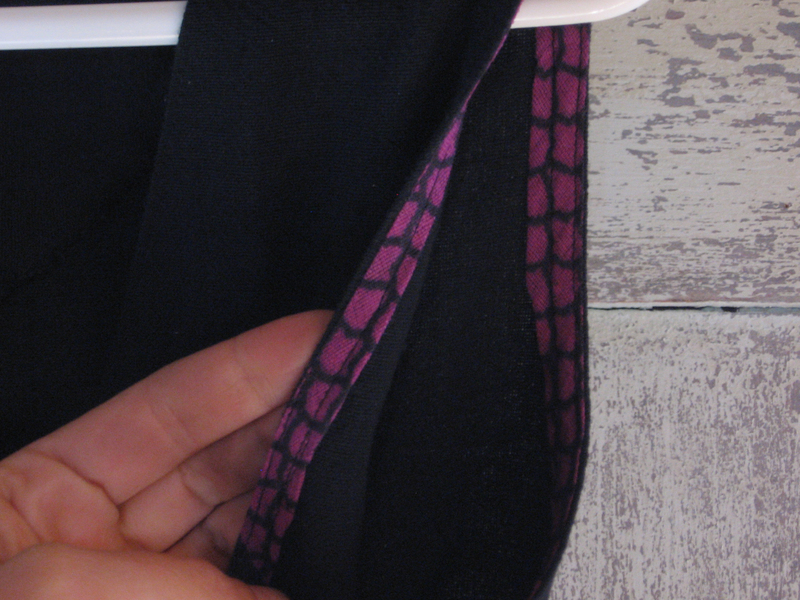 I am sure that some would prefer the right side of the hem, but I was really drawn to the muted colors and slight imperfections of the wrong side. 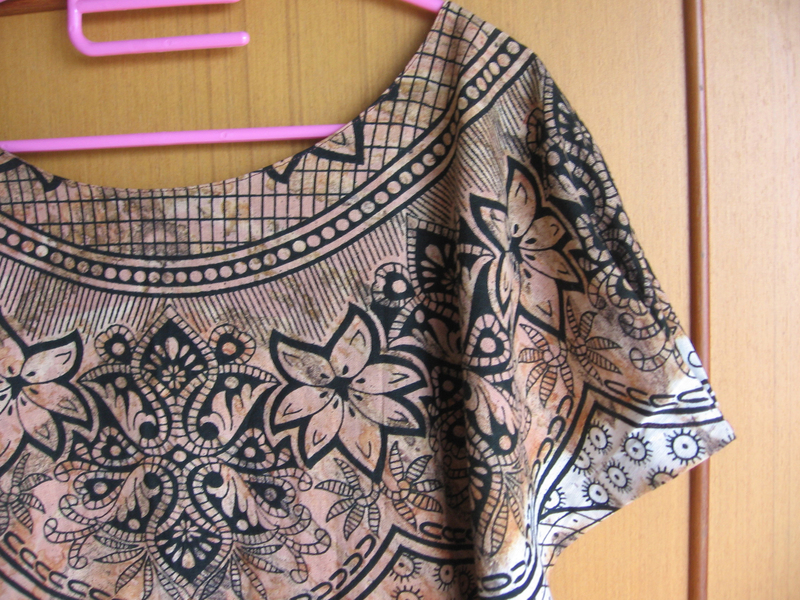 I saved enough fabric to make another garment, and maybe the next time I will use the right side. 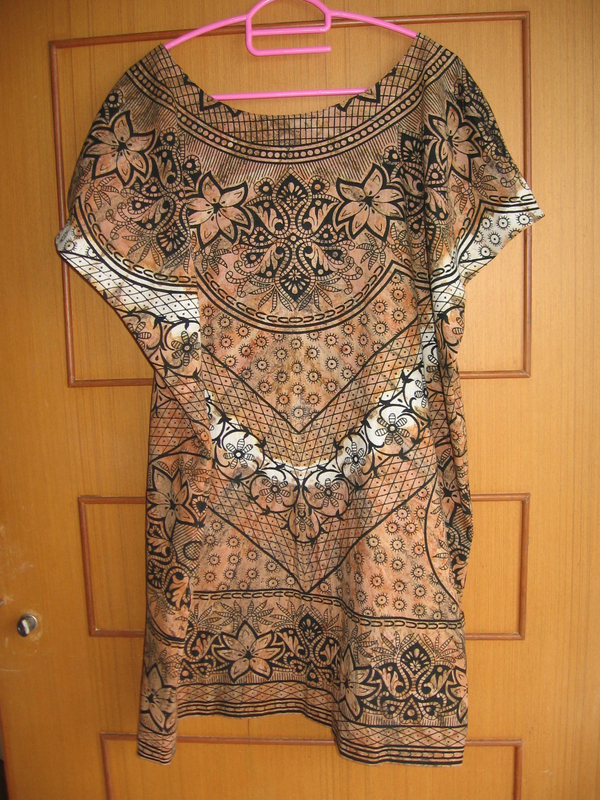 The third dress went along with the simple brown theme and was brown the whole way through, border and all. I made it simple to experiment with using only the cotton. I also wanted to try to belt this dress, and felt that the quieter brown would lend itself well to that. 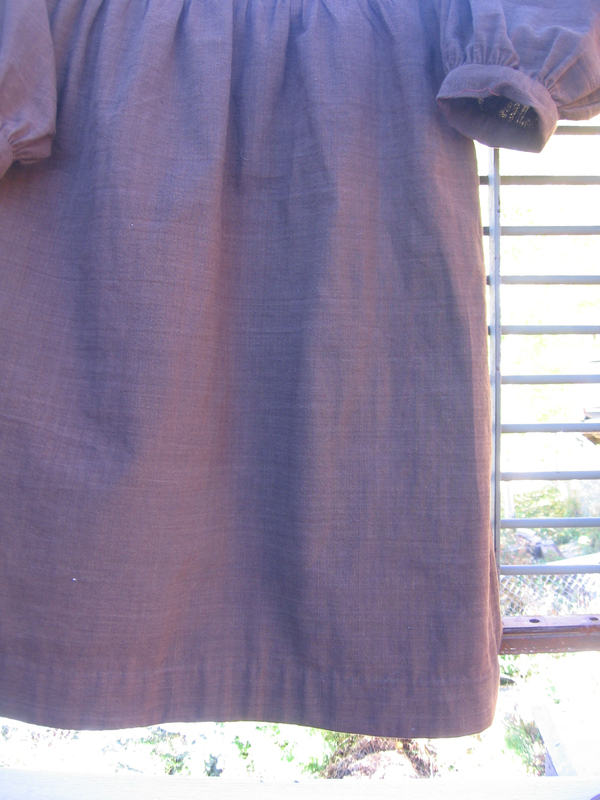 The plain brown one is also about an inch longer, to adjust to the belting. It is delightful to me how two different pieces of fabric, with the same general format can inspire two different designs. By general format, I mean size, color scheme, etc. 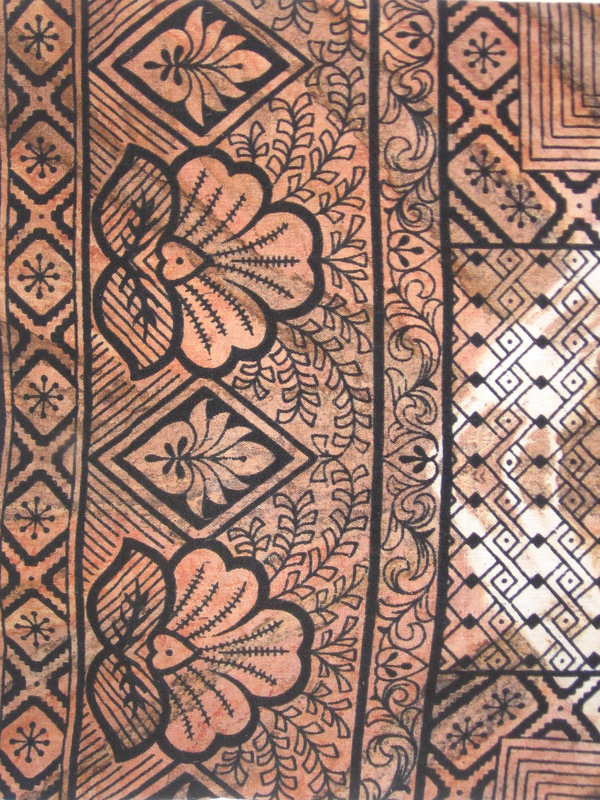 The difference in these two pieces of fabric was the geometric pattern printed in black. One piece of fabric seemed to be based more on squares, and the other on circles. 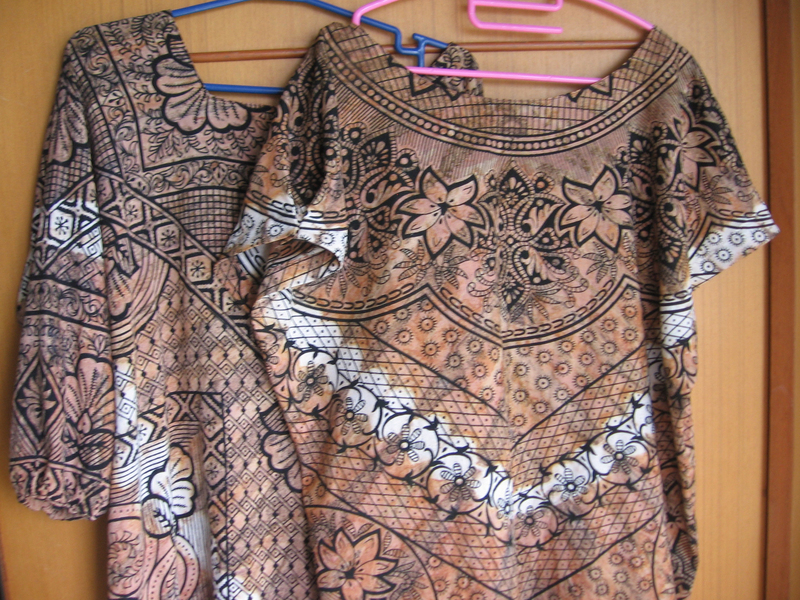 From that difference came the two different dresses. Circular vs square neckline, and on and on. 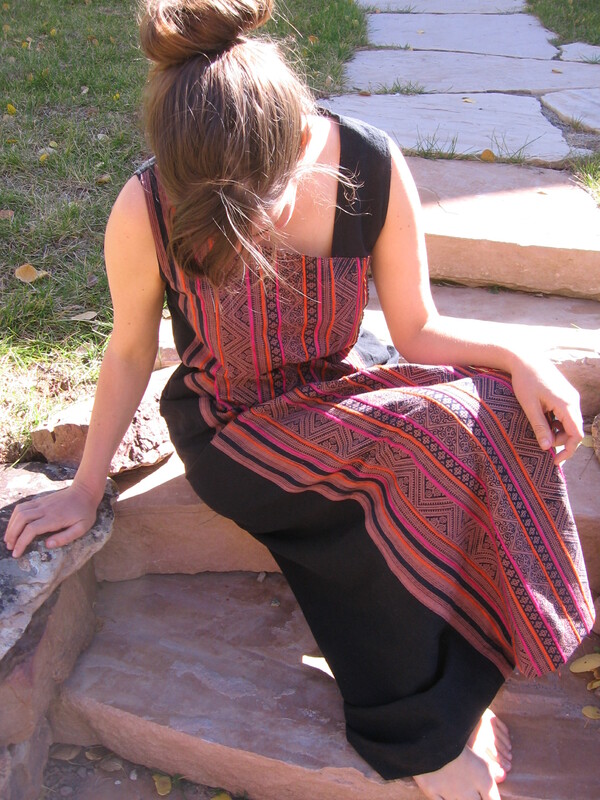 The second dress is also a tunic shape. A bit on the large size. Again, the patterning creates an illusion of shaping! The sleeves are a little bit more interesting. I added little pleats on the cuffs, and they pouf out a little bit. The sides of the dress match up nicely, with circles being created at the seams. 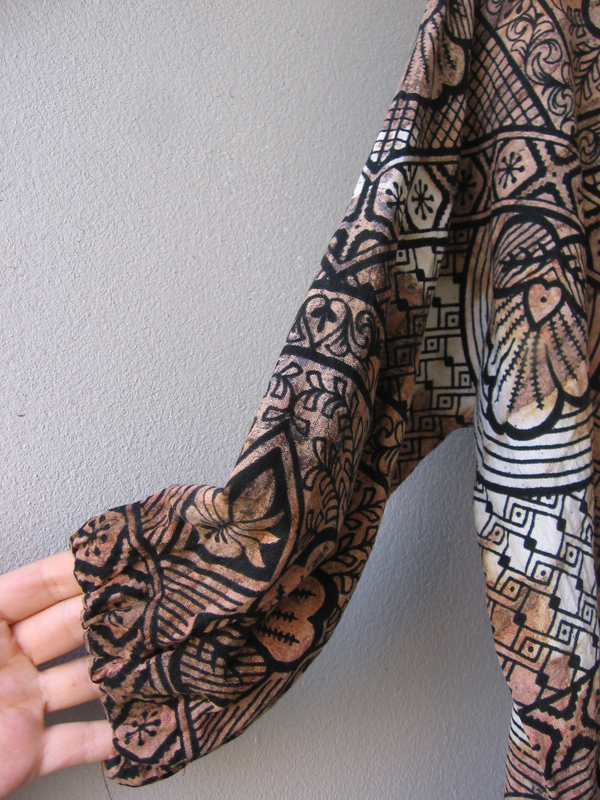 I love how geometric this fabric is. 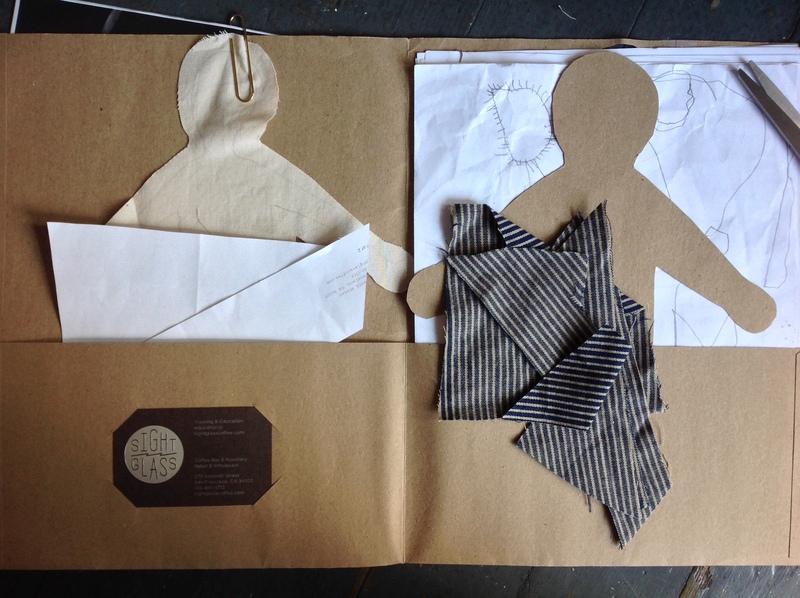 The cutting and sewing are easy because of the patterns. The rest of the dress is pretty much straight down. I am thinking that it would look good with a belt, but I don’t have one yet to try it with. 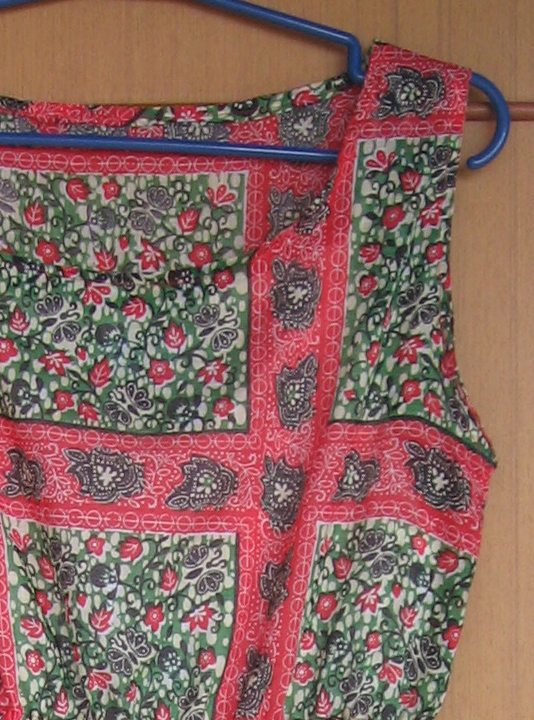 This is a dress pattern that I have made before, but with a new material. 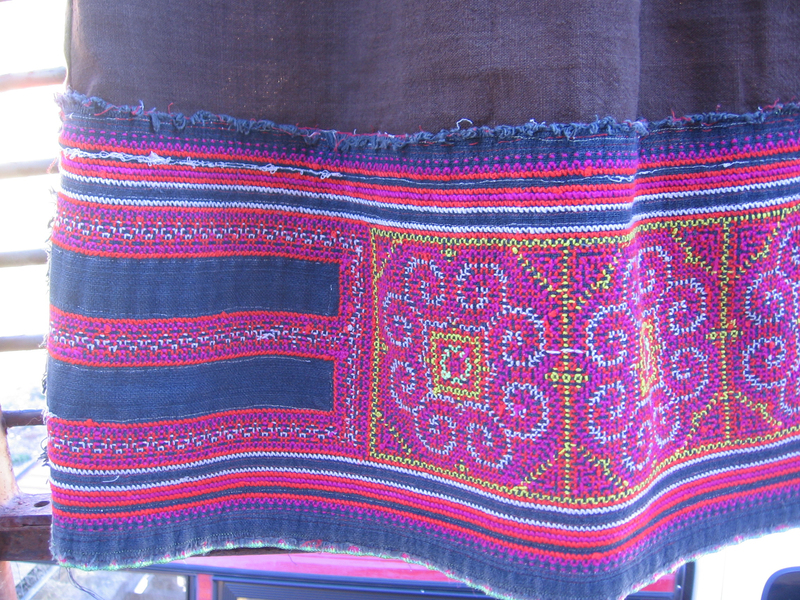 I found the fabric in one of my new favorite spots in Bangkok, Pahurad. It is a street completely packed with fabric vendors. All kinds of materials are piled, stacked, and stuffed into every possible space. I would be happy to wander around for a few days just to see everything! 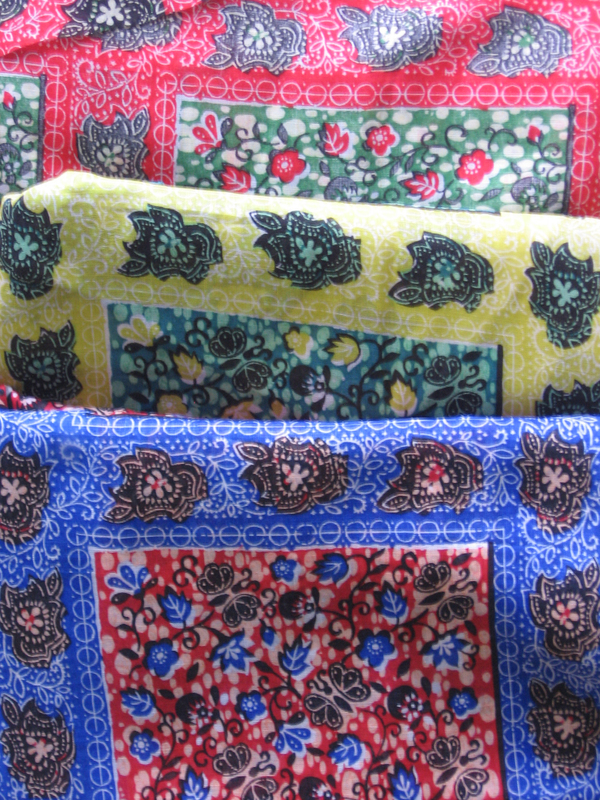 The fabric came in three different colorways. 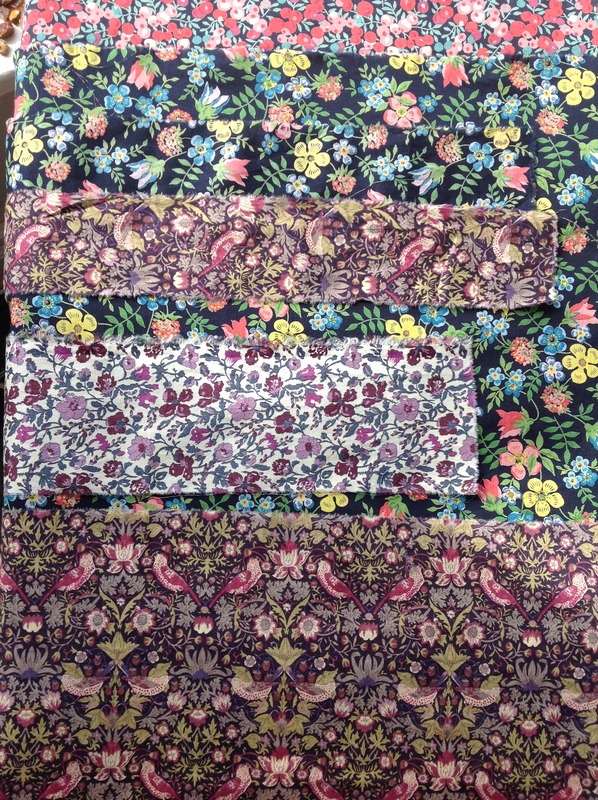 I bought several meters of each, and plan on taking the additional two colors to the dressmaker with my dress and the pattern. So far I do have only one difficulty with my interactions with the dressmaker. I don’t speak Thai, and she doesn’t speak English. We manage to communicate many things with pointing and smiling, and the rest we figure out by calling someone on the phone, or stopping by and talking with someone who can translate for us. I would like to have her make some dress samples for me in different sizes, but so far I am not exactly how to tell her that is what I would like. This whole dress making business is certainly a good motivator to learn a bit of the language!! I have a sewing machine, fabric, and time to sew! 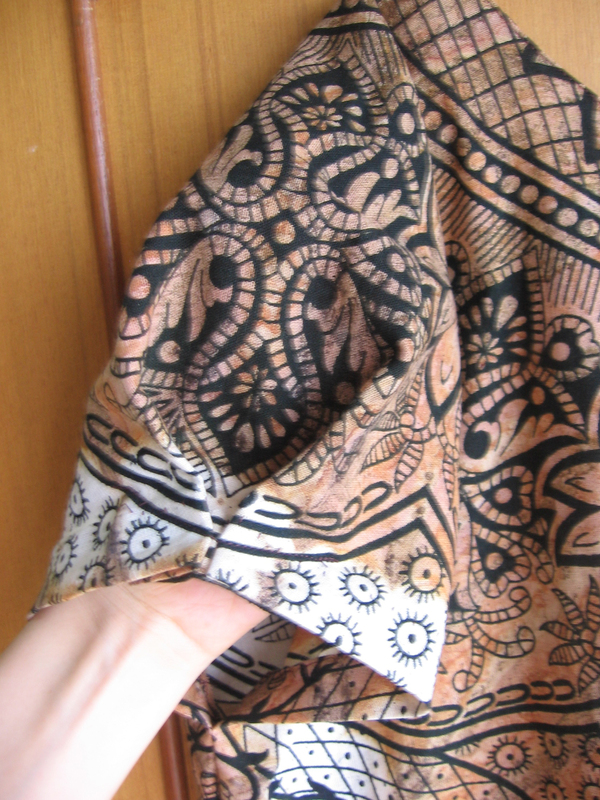 I got this piece of fabric from India, and was going to save it for a tablecloth or something like that, but I held it up as a dress, and loved it! First thing was to cut the neck, square to match the pattern. The dress is rather shapeless, and almost more of a tunic. There is so much complexity in the pattern on the material that I didn’t think that it was necessary to shape the dress itself. I decided on gathering the sleeves to add a little finishing detail. Because there is so little shaping, it needed a little something to add dimension. I tried belting the dress, but the fabric pattern didn’t lend itself to the shape created, and the dress ended up looking a little bit top heavy. The machine stitch worked well though, and I am excited to have learned how to do it. 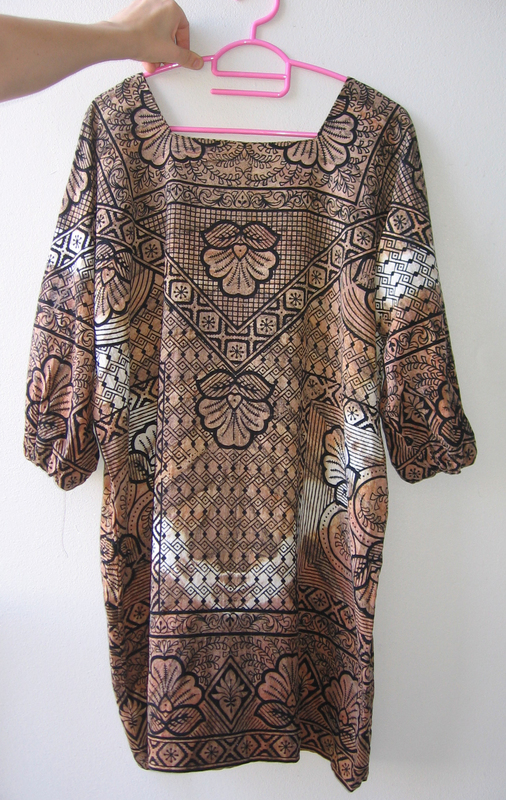 I think that the fabric was tie dyed somehow, and there is a strong band of white going around the dress. I am considering dying the fabric a little with some coffee to darken the band. I think that I will have to wear the dress a little first to decide if I like the band or not.